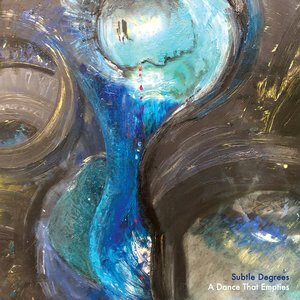 With just drums and sax, Subtle Degrees crank up a whirling dervish of sound. When Sesame Street puppeteer Kevin Clash appeared on a public radio quiz show, he answered a question in both his natural speaking voice and his Elmo voice. The length of time between the two voices was so brief that the show's host remarked that he could almost sense an overlap of the two. Eerie, no? The reason I bring this up is that I am struck by the same eerie feeling when I hear Travis Laplante playing his tenor saxophone on the first movement of A Dance That Empties. As Gerald Cleaver gently makes use of his whole drum kit, Laplante is rapidly arpeggiating through various chords. His playing is swift and precise, so much so that I find myself thinking that he might be pulling off more than one note at once -- musical ventriloquism. In 2011, saxophonist Travis Laplante and drummer Gerald Cleaver released what I thought were some of the most interesting jazz albums of that year. Laplante has a way of doing a lot with a little. When he makes a solo album, it's an actual "solo" album with just him and his horn. As a member of Little Women and Battle Trance, he certainly doesn't hold back on the honking. No matter what ensemble situation he is in, Laplante can fill the space with sound as if he were a piano or a guitar. Yet he felt that a recorded collaboration with Cleaver would have to wait until he developed his playing and his ideas a little further. A Dance That Empties is the result, an album-long suite in three movements. The first and third movements are the endurance tests where Laplante relies on his circular breathing skills. As I mentioned before, the first movement is where he builds a chord progression out of many individual notes. These chords shift around gradually, making an ensemble name like Subtle Degrees sound even more appropriate for this minimalist duo. Cleaver's role isn't as clearly defined as Laplante's. On the one hand, what he's doing can be perceived as improvising, a way to fill the air with even more sounds. On the other hand, you can look at him as a driving force who's there to keep the saxophone moving along. But knowing that Laplante has recorded an entire album by himself, it's safe to say that Cleaver is no mere safety net. If Laplante was suspiciously blurring notes together during the first movement, then I'm positive I'm hearing overtones at the start of the second movement. The meandering and tempo-free beginning doesn't last long as the track finds its second gear in a more loud and abstract territory. The musical structure behind the notes gets thicker as Cleaver gets ready to take over with a pulverizing solo. The final movement is the longest one at 18 minutes. Unlike the two that came before it, this one starts off with a blaze of sound. The two men keep the racket happening for about two minutes before the next drum solo. Here, Cleaver puts the room mics to the test by punishing the cymbals on his drum set. After establishing what can probably be described as a heavily fractured groove, Laplante takes a more melodic route. Things don't stay that way for too long, though. This final movement of the album takes full advantage of its length to give the sound extra peaks and valleys. With about seven minutes to go, Laplante starts to rapidly tumble through arpeggiated cycles again. He speeds up as Cleaver jumps in, pushing himself into a saxophone-induced seizure that transforms into a note held for close to two minutes. It would be very easy, and tempting, to say that A Dance That Empties is Travis Laplante's most ambitious projects. Then again, it's been a while since I heard those Little Women and Battle Trance albums. And there's certainly no telling what he plans to do next. Who knows, maybe the next thing he tackles will be even more draining than A Dance That Empties. Any way you look at it, this is one hell of an album. It seems that Travis Laplante can play anything and Gerald Cleaver can play alongside anybody.